-A Good Debutante's Guide to Ruin by Sophie Jordan: already read and was SO good! -The Catcher in the Rye by J.D. Salinger: this month's book club book, people seem to either hate this or love it. I'm a bit scared. -Sisters' Fate by Jessica Spotswood: so I haven't actually started this series yet, but I hope it's full of witchy goodness. -Cats for Dummies by Gina Spadafori: cause we've never actually had a cat before and I need more knowledge. She's so cute! Good luck! I have two cats :) Nice haul! Awwww! She's so cute! How old is she? I haven't heard of Sisters' Fate before, but witches are always awesome. :) A Good Debutante's Guide also sounds good. I hope you enjoy your books! She's 3 months old :) And thank you! Adorable cat! I have had cats since the moment I was born, lol, so I am a self-taught "expert". She's very cute and have fun with her. You'll learn as you go along, but reading the book can't hurt. Have a good week with your reading. Aw she's so cute! And it's always a good idea to aquire some extra knowledge about a new pet :). When we got our four pet rats I did quite some research to make sure we gave them the right food and cage. I am not really a cat person, but the cat is very cute. I hope it brings lot of joy to your house, as I am sure the little kitten will be a bundle of energy. And ooh The Catcher in the Rye is a book I have been meaning to read for a long time. Hope you enjoy. From a professional cat owner (or something) my one piece of advice to you is: ALWAYS PET THE KITTY. Have fun! What a darling kitten! 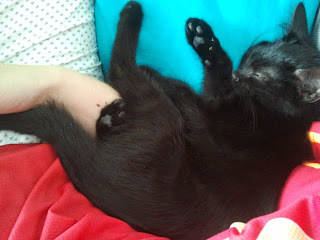 My first kitty was all-black, too, except for a tiny bit of white at his neck. His name was Henry. He died over 30 years ago, and I still miss him. I'm going to have to check out those Witch Chronicles. Thanks for the link!